Dr. Sara Wilensky | Valley Pediatric Dentistry, P.C. Dr. Sara received her Bachelor of Arts in History from Binghamton University in 2011, her Master of Arts in Biology from Binghamton University in 2012, and her Doctor of Dental Surgery from Stony Brook University School of Dental Medicine in 2016. She completed her residency in Pediatric Dentistry at Cohen Children’s Medical Center in 2018, where she served as chief resident. 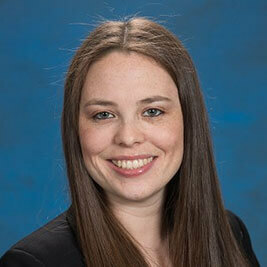 Dr. Sara is a member of the American Academy of Pediatric Dentistry and the American Dental Association. She participates in Give Kids a Smile and has provided dental care locally, nationally, and internationally. In 2015 she traveled to Madagascar as part of a volunteer mission to provide dental care and education for the Malagasy people. Dr. Sara’s education and training have enabled her to provide dental care for children of all ages and patients with special health care needs. Her passion and enthusiasm for pediatric dentistry and teaching have allowed her to motivate and educate her patients and their parents about the importance of oral health. Dr. Sara believes that creating a positive and fun experience for children at the dentist is important and will have a lasting impact on their overall health.